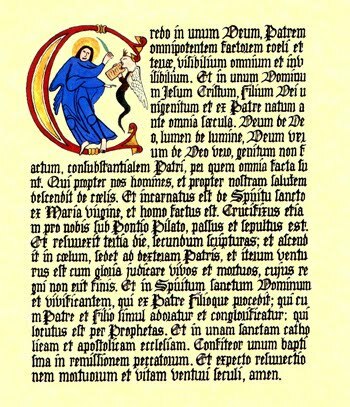 "Et unam sanctam Catholicam et Apostolicam Ecclesiam"
And in the Creed every Sunday we proclaim that there is “one holy catholic and apostolic church” but what exactly do we mean when we say that? What we are saying here is that the Church we profess is not just universal as in all encapsulating, everywhere, but that our Church is descended from the original Apostles of Christ, that we are uniquely connected to them through the Apostolic Succession – the fulfillment of the promise of Christ to His Apostles that He would send them the Holy Spirit to teach them all things [John 14:16 & 26, 16:7] and that He would be with them always until the end of time [Matthew 28:20]. What we are proclaiming here, in the Creed, is what distinguishes us as Catholic Christians from other “churches” for we are “Apostolic” meaning “of/with the Apostles” which assures us of our closeness to Christ and to God. For by this Apostolic Succession we are able to know Christ’s abiding presence with the Church through the grace and efficacy of the Sacraments. Through the Apostolic Succession – the passing on through the laying on of hands at Ordination, of the sign of the Holy Spirit – we are able to receive the Eucharist and receive forgiveness through sacramental Absolution, we in effect are able to witness and receive those “outward and visible” signs of God’s “inward and invisible” effectual grace. When our bishops and priests offer Mass, we know that Christ through them – “in persona Christi” or “alter Christus” – is able to offer Himself both as priest and victim [Ephesians 5:2 Romans 4:25 Council of Ephesus (Part III, ch. i, anath. 10)] of His one eternal Sacrifice – the Crucifixion – through which our Salvation has been assured [Hebrews 10:14, 1 Peter 3:18, Romans 5:6-10]. Last Thursday at our votive Mass for “Our Lord Jesus Christ, Eternal High Priest” I taught from the Epistle to the Hebrews about the intrinsic correlation of the Sacrifice of the Mass to the sacrifices once offered in the temple at Jerusalem. How Christ is both the “covenant”, the “high priest” and the “victim” and of the importance of that understanding to our comprehension of what the Mass is really about. Of Christ’s sacrifice on the Cross and His ministry and person being the completion, the fulfillment of the Old Covenant between God and His then “chosen people” (the Israelites) and the New Covenant in Christ for the salvation of His people. I have also preached much lately on the theme of God’s “Plan of Salvation” as we have celebrated recently the lives of St John the Baptist, of St Anne (Mother of Mary), we have heard again the Gospel of the Annunication and this week will celebrate the birthday of the Blessed Virgin Mary. I have talked much of “vocation” in this context also, of the vocations of Mary, Elizabeth, Anne, John the Baptist and then also of Andrew and Peter and of those others whose place in the history of our salvation was no accident, but whose “ad sum” or “fiat” to the will of God effected His plan of salvation and how our vocations, individually given us from God “I knew you before you were in your mother’s womb” [Jeremiah 1:5] are intrinsically linked to the perpetuation of that plan, particularly vocations to the Sacred Ministry which allow the Sacraments which effect Christ’s continued abiding presence with His people through them. It is largely through lack of teaching and understanding about the Mass and God’s plan for salvation that much of today’s divisive debates in the churches take place especially around the subject of vocation. Let us remember in the first place that essentially man and woman are not the same. A woman can give birth, a man cannot. This is an undeniable fact of nature. It is not true therefore to assert, as some people do in the equality debate, that the roles of men and women are interchangeable. They are not. Aside from the simple biological and physiological differences, the fact is that everyone is “individual” not all have the same abilities, or are gifted with the same talents. I cannot be you and you cannot be me. Nature, nurture etc the evidence of science is that no two people are alike – even twins are recognisably different persons even if they do share specific attributes. The point is here, that in creation there are only two forms of human, male and female and there is a very obvious distinction between the two! In God’s plan of salvation, this diversity in humanity is recognised and balanced. Man cannot give birth, therefore Christ had to be born of a woman. A woman having given birth to the Saviour, then to balance things out, she should give birth to a son, a male child. Together, the two, male and female, bring about the salvation of the world. For this reason, Our Lady is also called “co-redemptrix”, “Mother of God” for her role in the plan of salvation was no accident, though it took her “ad sum” to Gabriel’s “ave”, her voluntary submission to the will of God, nonetheless, it was purposed. Christ in like manner, to fulfill the Old Covenant, needs must be male, to be a “Son of David.” In this way God’s plan of salvation is not divorced from that of His creation – He works through and with His creation to bring about salvation. It was not through any other limitation other than God working His plan of salvation through His creation that Christ chose men to be His Apostles – as through woman humankind receives life, so through man humankind receives salvation. To suggest that His choosing men was due to the “limitations culturally” of His time is to suggest that the whole Gospel – His life, ministry, passion, death and resurrection – is somehow not eternal. That this Jesus of Nazareth was not the Christ but a Christ, not the Messiah but just another prophet. This is the fundamental problem with regard to the prevalent misunderstanding and lack of teaching regarding the Mass – it is not simply a “family meal” it is a sacrifice – it is not simply a memorial, it is a witnessing of that same one oblation made once and for all time, that single moment in our history, the Crucifixion, the sacrifice of the Son of God for man in atonement of sin. You see brethren, true equality is about recognising and embracing diversity – it is not about making square pegs fit into round holes – it is about accepting the true nature of things and their inherent qualities or attributes that contribute to the whole. In this case, in God’s plan of salvation, it is about seeing that “male and female He created them” and through His creation, the role of saving humankind was shared equally between mankind and womankind. In the perpetuating revelation of God’s plan of salvation, the two kinds continue to have a vocation each that contributes to the whole. In the same way that from man comes the seed and from woman the egg, together creating the new person; so too with God’s plan of salvation – through the woman the male saviour is born, both aspects of humankind together share roles in the salvation of the human race. Without Mary’s “ad sum” to Gabriel’s “ave” there would be no birth, no saviour, her role is obviously pivotal in God’s salvific plan. The assertion that some would make that the Catholic (universal) Church is “patriarchal and sexist” is simply not borne out by Catholic teaching regarding God’s plan of salvation, by our recognition of the Blessed Virgin as co-redemptrix. I am firmly of the opinion that this debate regarding the ordination of women is largely due to the fault of pastors not teaching the faithful the proper context and symbology of the Mass and of contemporary liturgy as not portraying the true “lex credendi lex orandi” of the Church. It is not difficult to appreciate the modern confusion of roles if God’s plan of salvation through His creation has not properly been taught, and how the personality of priests presented in “versus populum” worship has led to a desire to “change” the face at the front! Previous Post On confusion still abounding… "Quo vadis?"